What an incredible last day our Capstone students had! 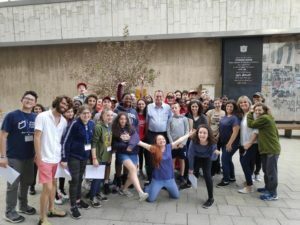 They started out at the Machon Ayalon where they learned about Israeli ingenuity in fooling the British in the lead up to the War of Independence in 1948. Since the trickery took place at a kibbutz, they also learned a little bit about the kibbutz as a pivotal communal settlement in Israel. 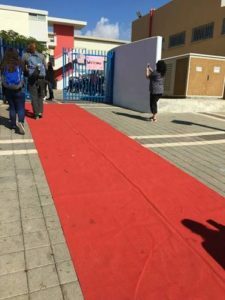 From there, they went to visit Kiryat Shalom, a neighborhood in South Tel Aviv for a red carpet welcome from Gal Wittleson’s, former HLA teacher’s current school, Nofim. Here are the Capstone students and Nofim students sitting together during introductions. After that, they headed to an important landmark, the site of the 1995 assassination of Prime Minister Yitzchak Rabin. They spoke of the importance of respect of all beliefs and for civility and respect in democratic politics. 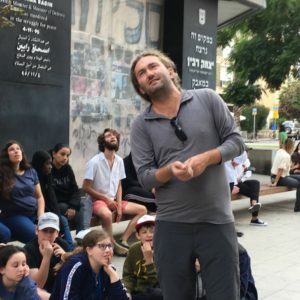 At Rabin Square, they had a surprise encounter with the Mayor of Tel Aviv who saw a group of students filling out forms on the ground as he parked his car (they were doing their final trip reflections). He approached them and asked the students what they were writing. They answered in Hebrew. Former Tel Aviv resident and Hatikvah teacher, Lilach, originally from Tel Aviv recognized Ron Huldai who was reelected last week. They told him all about our schools and took this happy photo with him. 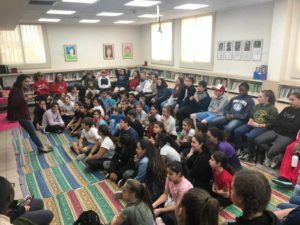 Their day ended in Jaffa with a last communal feast at famed restaurant Dr. Shakshuka and a walk through old Jaffa at night. The students bid each other farewell and thanked the chaperones for all their help. We’re looking forward to hearing more from them as they digest their experience and look forward to their help to make Capstone Year 3!